To celebrate the 500th birthday of the formidable Catherine de’ Medici, we will be posting seven articles over the next seven days about her. This is the fifth, and it will focus on the relationships with her three surviving sons – who all became King of France. When Catherine was married to the second son of King Francis I of France, she was never destined to become Queen. 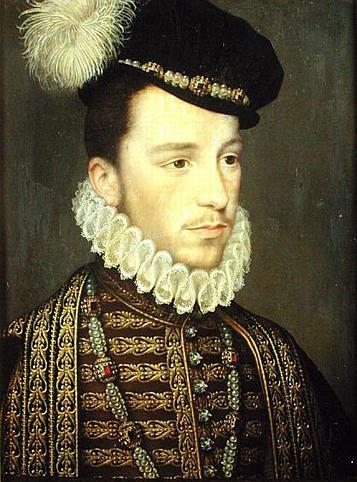 In 1536, the House of Valois received a terrible blow, when Francis’ eldest son and heir died aged eighteen. This single event set Catherine and Henry’s life on to an entirely different path, and over her lifetime she would become Queen of France and the mother of three French kings. Catherine was Queen of France from 1547 to 1559 when her husband King Henry II died young in a jousting tournament. 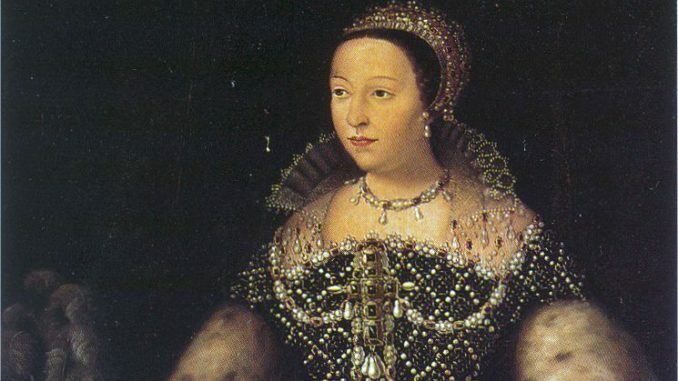 Though she had ruled as Queen for twelve years, Catherine knew little about running the country as political influence had always come from Henry’s mistress Diane de Poitiers. Catherine did know that at the time her husband had maintained a balance of power between the Montmorency and Guise dynasties and his death had left a power vacuum. Catherine, therefore, had to be by Francis’s side in order to stop the influence of each faction. Despite Catherine’s best efforts, members of the Guise family moved quickly and in a coup d’état, moved into the Louvre where Francis II and his wife Mary, Queen of Scots were living. The Guise’s were Mary’s uncles; this gave them the upper hand on the other factions. From this point, Catherine had to keep the other factions on her side by maintaining some of their powers and titles, while working with the Guise. By 1560, Catherine was mostly running the king’s regency council and took an active part in ruling France. Francis himself was often out playing sports and hunting and had little urge to rule. It was Catherine that had to try to negotiate with the Guise at this stage, on top of dealing with attacks from the Bourbon princes, all while Francis II’s health rapidly deteriorated. Catherine realised that her son Francis would not survive his illness which is reported to have been an ear infection. In order to make sure that there would be less of a power struggle as her next son took to the throne, she made a deal with Antoine of Bourbon. In return from the release of Antoine’s imprisoned brother, Antoine would drop his claims to the regency of the next king. On the 5th of December 1560, King Francis II of France died aged just sixteen. 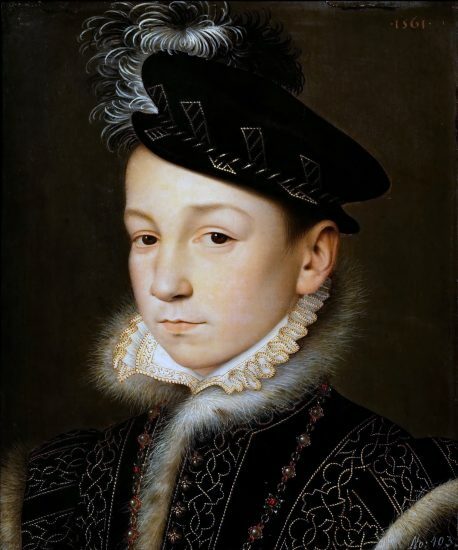 The new King of France was now nine-year-old King Charles IX, but he would never rule entirely by himself. As Antoine de Bourbon had relinquished his claims to the regency, he was placated with the role of lieutenant-general of France. This move kept Antoine where Catherine could see him and lessened the Guises’ power. 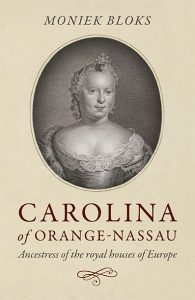 Catherine then proclaimed herself head of the regency council, the gouvernante de France and announced that until her son was of age, she would “govern the state, as a devoted mother must do”. From this point Catherine was the de facto ruler of France, an absolute monarch in all but name; but the reign was marked with endless war and was never straightforward. With the help of her chancellor, Michel de L’Hôpital, Catherine became a true ruler and kept command of her council with ease. Catherine oversaw all policy making, raised taxes, overhauled the royal household’s expenditures and opened all of the king’s letters. During this period France underwent a number of positive changes under Catherine’s rule; weights and measures were unified, taxes for moving goods between regions were dropped and magistrates had to be elected in order to prevent misuse of office. In 1562, Catherine aimed to calm religious tensions by issuing the Edict of Saint-Germain which recognised Protestantism and allowed for private worship. However, the ratification came too late; after the Massacre of Vassy which killed over sixty Huguenots. This event led to the beginning of the first French War of Religion; the wars devastated France for a century. 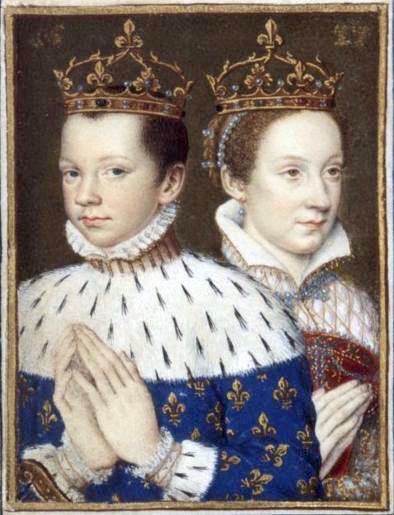 As France ebbed in and out of times of war and peace, Catherine continued to rule with her son Charles when he came of age. In 1572, an event happened for which Charles IX reign is often remembered; The St Bartholomew’s Day Massacre. Catherine and Charles IX are often implicated in instigating this massacre of Protestants after calling for the death of certain Huguenot leaders. The violence spiralled out of control as Paris was filled with people for Catherine’s daughter Margaret’s wedding to the son of Antoine de Bourbon. In all, around 10,000 Huguenots were brutally murdered, though the king had only ordered the deaths of a few people and tried to stop the spread of violence, this clearly did not happen. Following this horrific event, Charles’s mental state began to decline rapidly with Catherine stating ‘I have a lunatic for a son’. The king would sob hysterically sometimes blaming his mother and sometimes blaming himself for the massacre. Charles soon became very ill and died from tuberculosis on 30th May 1574 aged twenty-three. He left behind no sons so was succeeded by his brother Henry. On the 30th of May 1574, Henry III became King of France. Thankfully, he was a grown man, but he was away in Poland at the time as he had been elected the King of Poland. Before he could travel back, Catherine stepped in again to help. When Henry returned to France, Catherine was overjoyed to be reunited with him. Henry, however, like his brothers before him had little interest in ruling the country and longed for a more private life. Charles had his pick of future brides as King of France and even Queen Elizabeth I of England was a possible suitor. However, he chose to marry the daughter of a minor Prince from the Lorraine family named Louise de Vaudémont to the dismay of his mother and statesmen. The couple were in love and were happy together, but they failed to produce an heir, meaning the Valois line would end with Henry. In 1585, Henry III found himself at war still with the Protestants but also against the newly formed Catholic league. This worried Catherine greatly as the threat of assassination was high. Henry listened to his mother and hired Swiss troops for his personal protection, at this time Paris was under lockdown. Catherine was deeply unhappy and afraid in this period, and her health began to fail her. At this time Catherine was suffering from a lung infection and was in bed. On the 23rd of December 1588, Henry had commanded his men to murder prominent members of the Guise family, including the Duke who was stabbed by Henry’s men. Upon hearing this, Catherine said ‘I see him rushing towards his end’. On the 5th of January 1589, Catherine died from pleurisy at sixty-nine years of age. The Queen Mother was not afforded a proper burial due to Paris being in enemy hands and had to be temporarily interred. A terrific five days of good information. Thank you — I know a lot of work went into these posts, and you honored Catherine’s anniversary well.